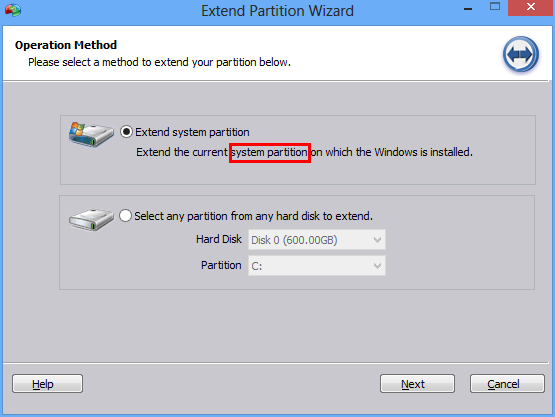 How to extend system partition in Windows Server 2012 easily? 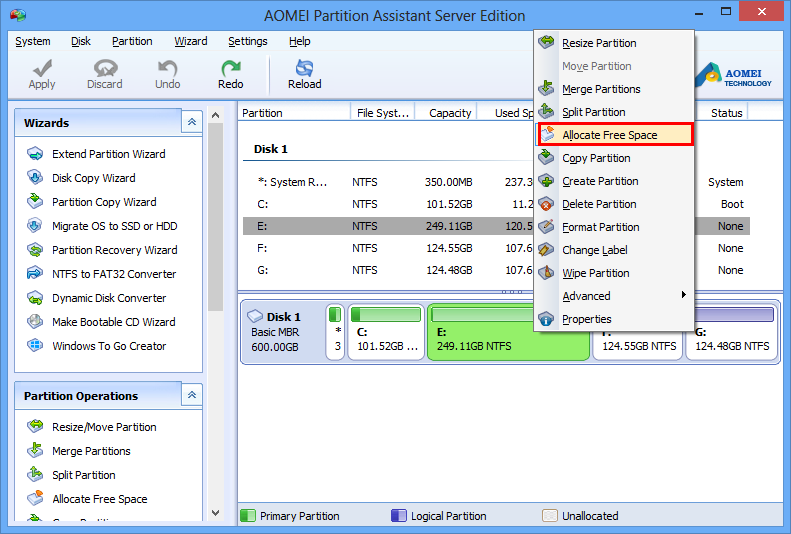 This article recommend you try AOMEI Partition Assistant Server. With it, you can extend system partition on Windows Server 2012 quickly and without losing data. Nowadays, more and more people use Windows Server 2012 and 2012 R2 to deal with their business. However, the system partition on Windows Server 2012 will run out of space someday. So I think the subject of extending system partition on Windows Server 2012 due to lack of volume or other reasons is still a good subject for computer users. Even a newbie knows that system partition will affect the whole computer’s speed. So we must clean the garbage files in time. Even so, we have to extend system partition to avoid the crashing of system and to improve the running speed in the end. When it comes to expand system partition, someone worried about losing data naturally. I understand it. In Windows Server 2012, you can extend and shrink drives with its disk management. But, unfortunately, resize partition with shrink feature and then extend system C: drive with the extend feature is impossible usually. Because to extend a drive there should be an “unallocated” space behind it, so you cannot extend the system C: drive by shrinking the D: drive directly. The only choice is deleting volume D or moving it. This is not reality. Thus it can be seen that, to extend system partition on Windows Server 2012 is inconvenience with Windows built-in disk manager. Besides Windows disk management, you can also try professional third-party partition software. To select a 3rd party tool, you should concern about its security, stability and usability. At last, AOMEI Partition Assistant Server stands out from software market base on comprehensive comparison. Its simple and friendly interface decides it is ease to use. It receives 5-star from the famous CNET verify it is safe and reliable. 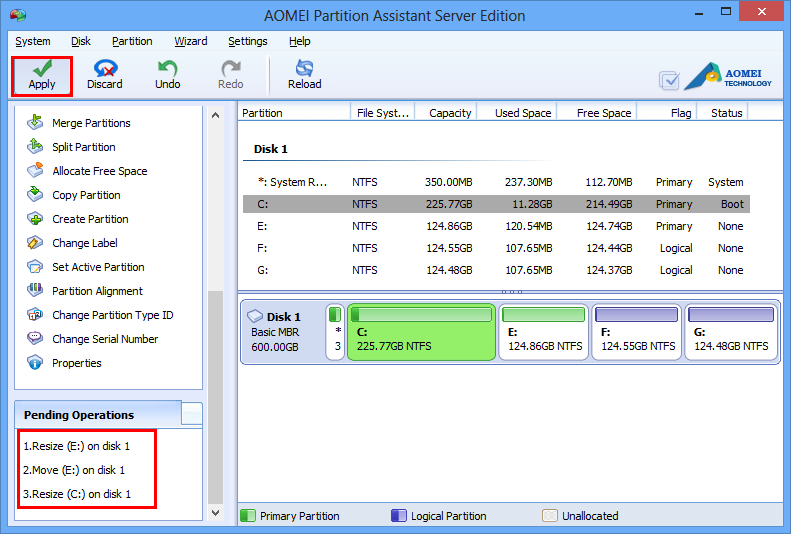 Following are tutorial to extend system partition on Windows Server 2012 with AOMEI Partition Assistant Server Edition. Step 1: Download it from AOMEI official website, install and run. You will see the main screen and disk map as the following picture. Step 2: Right click partition E and select “Allocate Free Space” option. In the pop-up window, type the value and select C:(system partition). Click “OK” to back to the main screen. Step 3: Now you can see there are three pending operations. Just click “Apply” to proceed if you have no question. Besides this solution, you can also choose the option of “Extend Partition Wizard” from the left toolbar. See picture below. When you select it, in the pop-up window, the first method is wizard of extending system partition on Windows Server 2012. Click “Next” to go. Here I won’t explain any more, I suggest you try and enjoy it by yourself. With the help of AOMEI Partition Assistant, only a few steps you can expand system partition successfully, and the system won’t reboot. What’s more, your data won’t lose. So I think AOMEI Partition Assistant Server Edition is the best choice to extend system partition on Windows Server 2012. 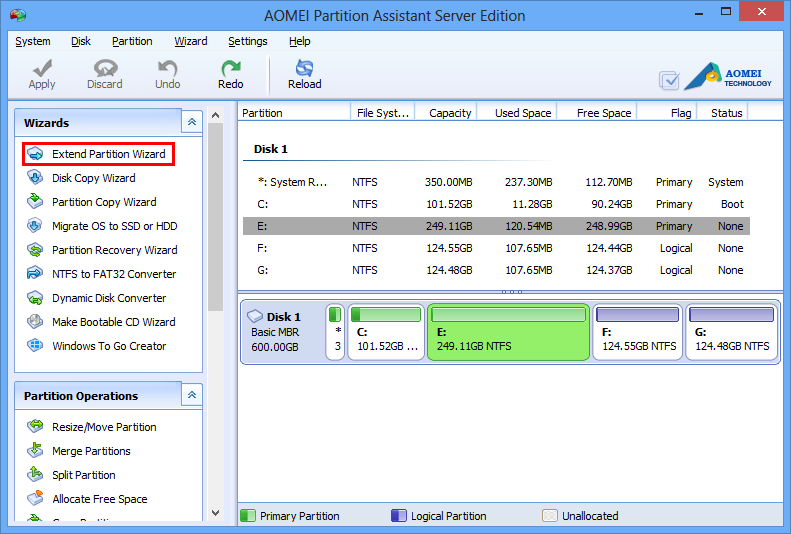 AOMEI Partition Assistant Server Edition can take the place of Windows Server 2012 disk management completely. Actually, it also supports Windows personal computer operating system: Windows 8.1/8/7/XP/Vista, all is no problem. Other Windows server operating system: Windows Server 2008(R2), Windows Server 2003(R2), all is OK. So if you own AOMEI Partition Assistant Server Edition, you can kill two birds with one stone.